After decades of pleas from those in need, a raise in the Newstart Allowance has finally had a much-needed boost of support, writes Pas Forgione. THE AUSTRALIAN Local Government Association (ALGA) – the national peak body that represents every council in Australia – this week voted overwhelmingly to support an increase to Newstart Allowance, the Centrelink payment for unemployed people. Newstart is $278 per week, making it $160 per week below the poverty-line and $178 per week below the pension. It has not been raised in real terms since the 1994 Federal Budget, when then-PM Paul Keating lifted the payment by $2.95 per week. ALGA's historic decision was made possible by a sustained, disciplined grassroots campaign targeting local councils, that began in South Australia last year and has since expanded to other states. This is a campaign led by unemployed residents and other welfare recipients on meagre payments who have lobbied their mayors and councillors, sharing their hardships with the media and the community, including members of Anti-Poverty Network SA, Australian Unemployed Workers' Union and Anti-Poverty Network WA. 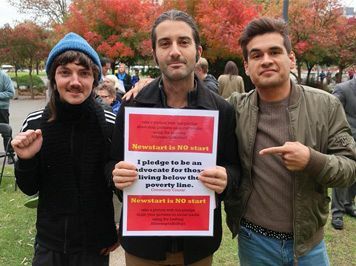 "In light of the burden placed on local governments across Australia to respond to the needs and challenges of people living in poverty and homeless, the National General Assembly calls on Federal Government to raise the Newstart Allowance to the level of the Henderson Poverty-Line to increase the wellbeing and life chances of many in our community." ALGA's decision to back an increase to Newstart continues a groundswell of institutional and popular support for such a raise. Over the past few months, Deloitte Access Economics, the Council of Small Business, the Australian Industry Group and, incredibly, former PM John Howard – whose Government did much to create the impoverishing, punishing welfare system that exists today – have all acknowledged the need for a long-overdue raise to Newstart. Earlier this month, an Essential Media poll confirmed what those who agitate for dignity and justice for the unemployed have long suspected: public opinion has well and truly shifted. 68 per cent of Australians support raising Newstart, according to the survey. This followed May's Per Capita survey, which showed public support (55 per cent) for increasing welfare spending. The Coalition's response to this groundswell has been, of course, not to increase to Newstart, but to attempt to reduce it by seeking to remove the Clean Energy Supplement, which would lower Newstart by $8.80 per fortnight. Where is the Labor Party when it comes to Newstart? Exactly where you might expect it to be — hedging its bets. Labor have opposed scrapping the Clean Energy Supplement. Opposition Leader Bill Shorten and other Party figures have acknowledged that $40 a day (or $17 a day after rent is paid, according to the Salvos) – what those out of work, competing for jobs in an economy where there is one job for every ten job-seekers, receive – is not a comfortable, adequate income. But, time and time again, Labor (with the sole exception of A.C.T. Chief Minister Andrew Barr) have stopped short of committing, firmly and clearly, to raising Newstart. Instead, Labor promises nothing more than a review – a “root-and-branch review”, to quote Shorten – of welfare payments, essentially the same promise it took to the last Federal Election, in 2016. Despite the change in community sentiment and the ever-growing body of research on the profound impacts of the abysmal Newstart on the health and quality-of-life of recipients, Labor has not yet moved beyond a position that basically tells those out of work and living in poverty: “We cannot and will not promise you a raise, but trust us, anyway." And that leaves unemployed people hanging. Indeed, in May, Labor joined with the Coalition to defeat a Greens motion in the Senate calling for a $75 per week increase to Newstart (a motion Labor called “a stunt”). For Labor not to do better is inexcusable. An increase to Newstart – not just an increase, but a significant one – is just, necessary and affordable. A $75 per week increase, as demanded by ACOSS (Australian Council of Social Service) – by no means a sufficient increase – would cost much less than the Government's income tax cuts ($10 billion vs. $13 billion over 4 years, according to ACOSS). “If I got an extra $20 per week, I could have breakfast every day. If I got an extra $50 per week, I could also have lunch every day. If I got an extra $75 per week, I could also have dessert once a week." Labor's national conference, its biggest and highest decision-making body, is scheduled for 16-18 December in Adelaide. It will likely be the last major political event before the next federal election, unless PM Malcolm Turnbull decides to call an early election. There will almost certainly be a critical showdown on Newstart. In the meantime, the growing anti-poverty and unemployed-rights movements, and the diverse coalition of local councils, trade union, community and other organisations, has six months to put as much pressure as possible on a political class that has once again shown to be out-of-touch with the public. A class which for so long has used the unemployed as scapegoats and whipping boys.